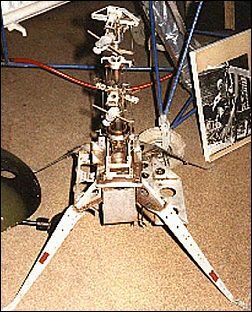 Built in 1975 as an experimental remotely piloted helicopter, and powered by two Veeco two-stroke piston engines. The WG.25 remotely piloted helicopter was a private venture project, designed to prove the basic concept for a radio controlled, fully controllable helicopter that could be used for surveillance purposes. In 1974 work began on a flying prototype which was first flown in June 1975. Having completed its trials programme the WG25 was stored until joining the museum collection in 1990, unfortunately less engines and rotor blades.